﻿blame it all on mexico!! Luna Lounge is excited to welcome the mesmerizing, award-winning singer-songwriter, Brittany Kingery for a special presentation of her new show “Blame It All On Mexico”. The new darling of Vallarta, Brittany brings her sweet, soaring voice and all-live band back to Luna Lounge. A Washington State native now living in Puerto Vallarta, Brittany earned widespread critical acclaim for her “Dream in Blue” show last season, a show that featured original “tropical rock” and cover songs inspired by her experiences and life in Bucerias and the surrounding areas. 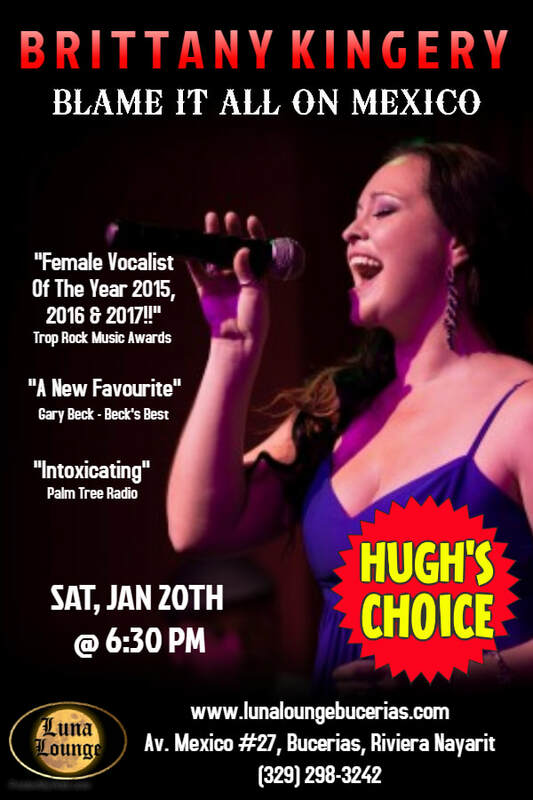 Her performance at Luna Lounge will be a unique opportunity to hear this gifted vocalist sing in the very town that inspires so much of her original music. Brittany’s accolades have been ringing far beyond Vallarta! She is a multi award winning artist including Female Vocalist of the Year, 2015, 2016 & 2017. She won Song of the Year and the Horizon Award for most promising new artist, all in 2015. Music from her two CDs of original tropically-inspired music, Edge of the Ocean (2013) and Dream in Blue (2014) plays regularly on Trop Rock radio stations worldwide. And her summer tours have touched every region of the United States and parts of Canada and the Caribbean, as well as other parts of Mexico. Luna Lounge is very proud to welcome her back to Bucerias for this very special concert!